Andhra cuisine is well-known for its high spice levels. I am being a spicy food buff have always had a liking for Andhra cuisine. “Ulavacharu” is one of the popular outlets in Hyderabad. They are well-known for their spicy food. During this new year eve, “Ulavacharu” is all set to cater Bangaloreans. Yes, it is opened in Namma Bengaluru at Kormangala. 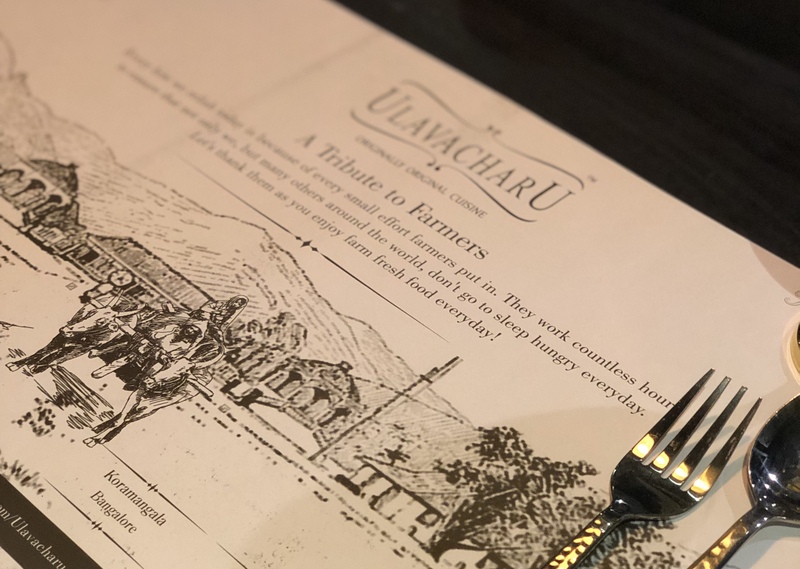 I have always been a fan of “Ulavacharu,” after I tried their food at Hyderabad. The new outlet in Bengaluru has a rustic ambience, which is replica of Gachibowli one. The old Telugu Songs & the décor made me feel nostalgic. I was totally engrossed in enjoying the food and ambience. The Idol placement of Lord Krishna makes the place celestial. The place is abode for many of socialites at Hyderabad and surprisingly I got to see the same trend in Ulavacharu Bangalore as well. A couple of Sandal-wood stars were dining during my second visit. Every meal should end with Sweet, however Ulavacharusurprises everyone with complimentary Badusha / Kakinada Kaja before the meal. Sounds great right! I thoroughly loved both the sweets, which are fresh and tastes great. Started off my meal from a starter called Pandu Mirapakaayi, the name itself was mouth-watering and it did not leave me disappointed. Cooked and smashed vegetables in the shape of chili with appropriate amount of spice left me craving for more.The dish is concoction of Andhra & hint of Chinese. Next starter I did try was “Mokkajunna Vepudu” – Vepudu / Fry is something which is pretty common in traditional & modern Andhra meal. Here, they have deep fried the battered baby corn and tossed in green chilies, chopped onions, curry leaves and cashews. One cannot say no to it. The showstopper was Gutti Vankaayi Pulav, it was perfectly cooked with the right blend of spices and brinjal. Gradually I felt the essence of Andhra. Well, the dish looks so simple. However, the brinjal gravy topped on the pulav will increase the spice levels gradually bite on bite. Then arrived the humble Pappu chaaru annaam with a dollop of ghee! The tender drumstick sambar was cooked in the authentic Andhra style and garnished with ghee fried cashew nuts. In no time Pappu chaaru annam was emptied. The dish served was extremely hot and appalam was the perfect accompaniment. Lastly, their Ulvacharu was amazing. I packed some home to fulfil my desire of having it whenever I feel like. The shelf life of this would be 10 to 15 days. “Ulavacharu” serves a lot of popular local non-vegetarian dishes. My non-vegetarian friends thoroughly enjoyed Bangla Kodi, Kona Seema Kodi Vepudu, Raju Gari Kodi Pulao, GadwalKodi Pulao and Andhra Kodi Curry. As I was full, I could not try their desserts. I have visited the place twice in such short span of time as I was craving for it. Nothing much to say, go on visit the place to feel a bit of Andhra in Namma Bengaluru.